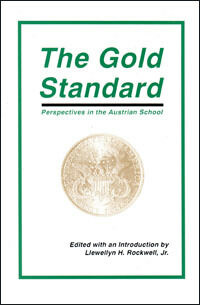 by Rockwell Jr., Llewellyn H.
A detailed guide to the arguments for the gold standard and its superiority over competing monetary standards. If you want to understand the gold standard, you need to read this book. The world’s financial system is in a precarious state, and everywhere the cry is heard for reform. The contributors to this notable anthology argue for one particular sort of reform, a return to the gold standard. They write from the perspective of the Austrian School. Murray Rothbard incisively criticizes another proposal for monetary reform, the monetary denationalization suggested by F.A. Hayek. He agrees with Hayek that anyone should be free to offer whatever he wishes as money, but it does not follow that what people offer would be accepted by others. For acceptance to take place, the proposed money must be taken to have value: and this, as the money regression theorem shows, can happen only if the commodity has some value in a non-monetary use. We have every reason to think that a genuine free market would gravitate toward a gold standard. An objection to the gold standard, common among monetarists, is that it leads to waste of resources. Gold must be extracted from the earth through expensive mining operations. With a paper standard, these costs can be avoided. Roger Garrison shows the fallacy of this objection. In considering rival monetary standards, the relevant issue is the opportunity cost of the competing systems, not the physical costs of resource extraction considered by themselves. If opportunity cost is taken into account, it turns out that the gold standard would be the least costly system. International finance is a tangled tale, but the distinguished monetary economist Joseph Salerno is more than equal to explaining its complexities. He considers the work of Michael Heilperin, one of the few prominent economists after World War II to favor a return to the gold standard. Heilperin’s work manifests great analytical ability and presents strong arguments for gold. It is weakened, however, by Heilperin’s belief that the state creates money. Had he realized the implications of the money regression theorem, he would likely have advocated a more robust variety of the gold standard. By far the most effective political advocate of the gold standard has been Ron Paul, and in an informative chapter he summarizes his detailed proposals for monetary reform. Other contributors include Richard Ebeling on Mises and the gold standard, Hans Sennholz on Carl Menger’s monetary writings, and Lawrence White on free banking and money. The Gold Standard presents cutting-edge scholarship on the best and most effective monetary system. If you want to understand the gold standard, you need to read this book. Introduction by Llewellyn H. Rockwell, Jr.
Is Gold Necessary to Free Banking?